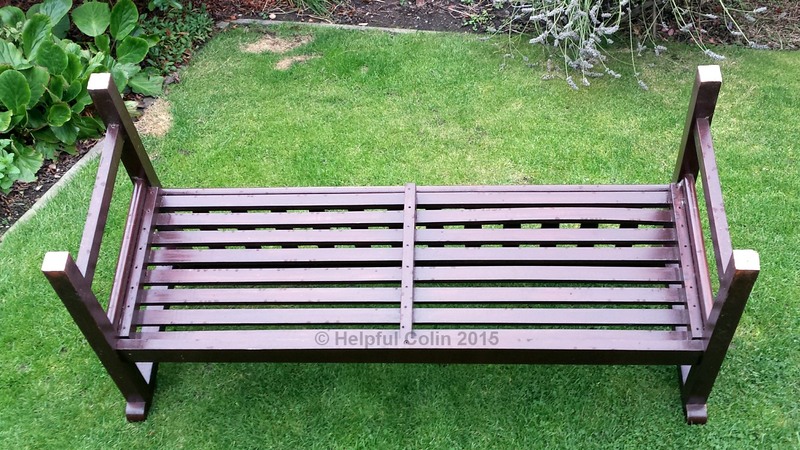 I have two teak garden seats which spend all their time outdoors on the lawn or patio. They go back to the 1980’s and the bottom of all the legs has rotted where they are perpetually in contact with the ground. I first noticed the problem while I had them upside down when I was cleaning and sanding them ready for repainting. I dug a penknife into the underside of the end of each leg only to find the wood was soft and easily dug out. I had painted them with exterior paint several times over the years but this wood wasn’t good to paint anymore. I had noticed a deterioration in the wood previously when I painted them but just put plenty of paint on the bottom of the legs after letting the wood dry out. The problematic area was in the bottom 5mm to 10mm of each leg and It had got to the point where the wood was crumbling away and the legs were no longer all of the same length. I had to find a method of repairing rotten garden seat legs. I decided to remove all of the bad wood by prodding and poking the leg ends with a penknife and sanding as necessary. I then let the leg ends dry thoroughly before applying polyester resin in the form of David’s Isopon P38 (a car body filler). I built up the leg ends beyond the original length. A few measurements and a bit of guess-work were required to determine what length to make the legs. The jagged nature of the leg ends made a good bond with the resin filler. Polyester resin sets in fifteen minutes and it can then be sanded. I wrapped a quarter sheet of course grit paper around a block of wood to sand the polyester resin. I sanded it until it was flush with the sides of the leg. Then I sanded the end of each leg until it was reduced to its original length. As is often the case when building up with polyester resin unevenness in the surface may appear after sanding to shape just because there wasn’t enough resin applied in the first place. It’s very easy to mix some more resin and apply it where necessary. Then after another fifteen minute wait it can again be sanded down. The polyester resin I used is grey but with two or three coats of paint the repaired area soon blended in with the rest of the seat. Yes the seats are teak and I used Sadolin paint. Some people leave teak to go grey and others oil it. Well if left to nature green stuff grows on it and it splits and deteriorates. After a couple of years outside the natural oil has gone and it takes paint. I have used Teak coloured Sadolin for years but now I have changed to Mahogany to match my windows. I actually repaired one seat in 2013 and the second in 2014 after I had seen if the first seat’s repair was satisfactory. What I found was: the polyester resin was very well adhered to the original wood and being water resistant kept the bottom of the legs from soaking up any moisture from the wet garden. Here is the final result as seen in the featured image rubbed down and ready for painting. Garden Seat No.2 repaired in 2014 – before painting. Previously the paint on the bottom of the legs soon got worn away by moving the seats about on the lawn and the patio so letting moisture into the wood. As soon as I covered the bottom of the legs with 5mm of polyester resin the legs were permanently waterproof. This has proven to be such a good method I would recommend building up new wood by 5mm before garden seats are put into use to prevent the initial rotting. However I am not sure if the oily nature of wood like teak would prevent the polyester resin from adhering when the wood is new. Garden Seat No.1 repaired in 2013 and photographed on 6th October 2015. Garden Seat No.2 repaired in 2014 and photographed on 6th October 2015. Garden Seat No.2, Leg No.1, repaired in 2014 and photographed on 6th October 2015. Garden Seat No.2, Leg No.2, repaired in 2014 and photographed on 6th October 2015. I will now have to wait for dry weather to repair these legs. It’s getting towards winter so when it is dry it might not be warm enough for P38 to set quickly. So I might find that I’ll have to wait until spring. I have a similar problem with our garden seat. I have just removed all of the paint with a Heatgun and have rotting feet. Just wondering what to do and this has given me an idea. Wondering whether Woodfiller Resin would do it in a similar way or whether the P38 bond might be stronger. I don’t have experience of wood filler resin. I have filled cracks with a liquid cellulose substance for dealing with rotting timber. I’ve been using P38 since the 1970’s. Initially I filled car bodies (in an amateur way) where they were rusting away or had been damaged. I read in the instructions how it can be used to repair many products. I have repaired broken corners on concrete slaps and filled the vertical letter mail slot in my front door before cutting a horizontal one. I have repaired a concrete fence post damaged by a car with an alternative brand of polyester resin. I had to paint it with paint for concrete because it cured to a bright pink colour. I think it can bond to any surface with free electrons to bond to. That’s why there can be issues with some plastics and why roughing things up with sand paper helps. The good thing about it, in my opinion, is the way it sets in around 15 minutes and is ready to sand down or to have another layer added on top. You won’t want to use a product that cannot be worked on until some hours have passed. Other epoxy resins can set quickly. They are fine to use if the price compares favourably. One issue with any resin – what is the final colour and does it matter – can it be painted? Make sure your garden seat timber is dry and free of oil before you start – you do want it to stick. Remove anything that isn’t solid timber with a penknife, chisel , scraper or sandpaper. I got most of my P38 from Halfords over the years. It had grey hardener in the past but it too has pink hardener now. It doesn’t show up too much when set but I thought it was a bad day when that happened. It is still basically light grey but will start to disappear under a couple of coats of garden furniture paint. Hi Colin, I bought a tin of that P38 from Halfords this morning. I imagine that it’s a bit like the ‘Bondapaste’ that I used to repair my car sills with many years ago. I’ve just finished stripping the seat so just got to give it a good sanding, repair the feet and then let the wife decide what colour she wants it stained. I have added some up to date pictures showing wear and tear if you want to look at them. Update is not 100% complete but I have to do something else just now. I wrapped a quarter sheet of course grit paper around a block of wood to sand the polyester resin. I sanded it until it was flush with the sides of the leg. Then I sanded the end of each leg until it was reduced to its original length. I do not understand this step. Are you wrapping the sand paper/coarse side in as a mold before adding the resin? What are you using as a mold so when you apply it, it is in the shape of the leg? Is it the sand paper? I appreciate you responding as I have a wooden bench that is my next project with some rot at the end of the legs. I didn’t wrap anything around the legs of the seats to form a mould. Having worked with Isopon many times I know it has the consistency of putty and I would get away without a mould. However the type of moulding you describe is not a bad idea. If I had chosen to make a cardboard mould I would have tried using cardboard from a breakfast cereal packet. If you do that and don’t want the resin to stick to it you should grease the cardboard with a thin layer of petroleum jelly. However since you expect to sand it afterwards that would remove any cardboard stuck to it. I just put a big blob of resin on the upturned end of the leg. While it was flexible and trying to hang over the edge I just kept drawing it up into shape with the plastic spatula used to mix and manipulate it. It stiffens up after a few minutes. Any excess is so easily sanded away once set. What I did with the sandpaper was to wrap it around a flat sided block of wood, with the grit on the outside, so that I could keep the sandpaper flat while I used it. That allowed a flat surface to be produced by the sanding process. Next Next post: Lighting Charts – Which Lamp Do I Need?